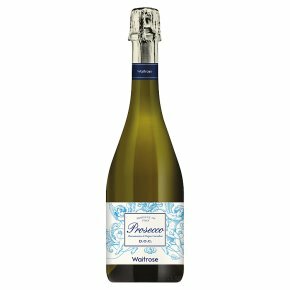 This is a smooth, fresh and fruity Italian fizz with attractive aromas of wisteria flowers and russet apples. On the palate there is a hint of sweet almond, typical of the Prosecco grape variety. This would be perfect as an apéritif or, alternatively, as a mix for sparkling cocktails such as Bellinis. It is an ideal choice for entertaining. Waitrose Blueprint wines are crafted to reflect the world's classic regions and styles. Refreshing and bright, with soft and gentle bubbles, this has delicate aromas of orange blossom and flavours of juicy apples and pears. The perfect party wine, it's also great served with a splash of cordial as an impromptu cocktail or with spicy foods.